West Side Comprehensive Chiropractic Care (New York) - Book Appointment Online! West Side Comprehensive Chiropractic Care, his Manhattan-based practice, has been a haven for those striving to improve their health, posture and sense of well-being for over fifteen years. Our full service chiropractic office utilizes diversified chiropractic adjustments as well as gentle light force adjusting. We focus on strengthening programs, postural correction, ergonomics and flexibility. Utilizing various physical modalities, we specialize in treating a variety of conditions from chronic back and neck pain to sports injuries and rehabilitation following an accident or injury. We provide information to improve the overall quality of your life. Dr. Watins specializes in stress-related problems such as headaches, neck pain and lower back pain. 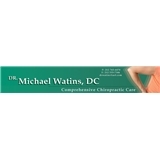 He has worked with many Fortune 500 companies in the New York City area, athletes and top CEO's, administering the highest quality of chiropractic care. Always super nice and explains very well. Always answers any questions that I have. Very thorough, supportive and felt like he knew exactly what was going on with my body.